It must be one of the most intense moments possible: a single clue for all of the marbles. 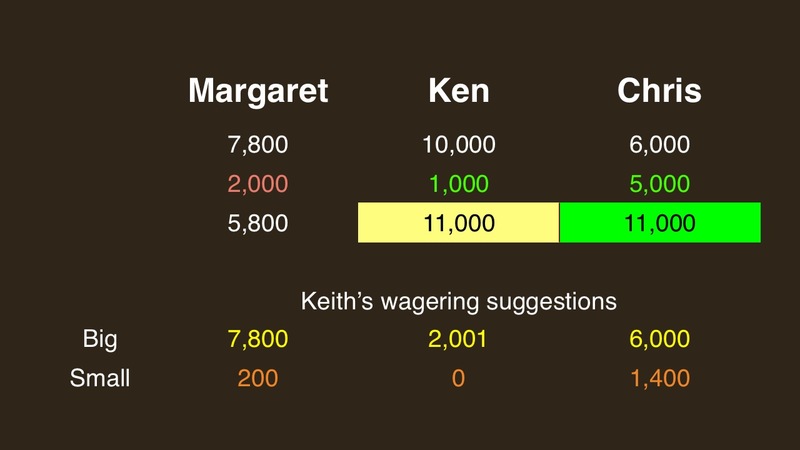 Unlike Final Jeopardy!, however, you have to be quick to think, and there are no longer any wagering considerations to take into account. First to buzz in and give the proper response wins. 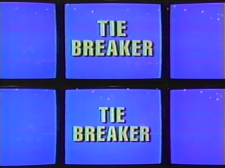 To date, there have been seven tiebreaker situations in the Trebek era. Only two were warranted, in my opinion; of the remaining five, four were captured by the player trailing heading into Final. Thanks to the J! Archive for confirming the known scenarios. I don’t usually criticize wagers in quarterfinal games because each player comes in with her own goal for a wild-card spot. This is the only tiebreaker that “should have” happened. 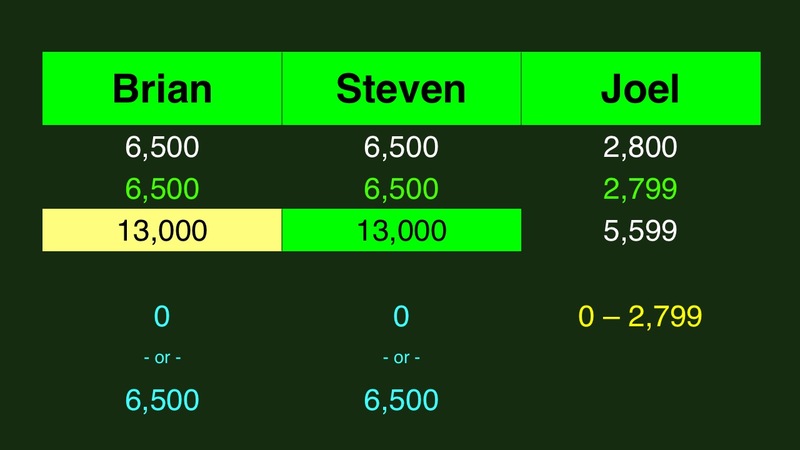 Brian and Steven were knotted up heading into Final, and had the option to either wager everything or stand pat. Both went all in, got it right, and wound up tied once more. It’s tough to get mad about Kids Week wagers – they’re kids! Hell, adults can barely handle this math. Mike’s withholding of the extra dollar gave him a scare, I’m sure, but he came out on top – the only player who mis-wagered to reap the benefit of the tiebreaker clue. Celeste DiNucci went on to win this TOC after Christian Haines was too conservative with his wager in their semifinal game. As a result of her ultimate victory, Celeste will appear later this season in the Battle of the Decades. The wagering by the leader in this game might have been the most egregious of the bunch: nearly a grand too much to lock out second place, even though her pre-Final score of 20,600 should have been more than good for a wild card. It pushed her into a tie with second-place Evan, who was going for a nice, round number. On the last day of Season 30, Jeff Xie entered Final Jeopardy! with a 5,000 lead over Alan Koolik – offsetting exactly his 10,000 deficit from Day One. Both players got it right and properly wagered everything, resulting in a tie. Jeff won on the first tiebreaker clue, worth an additional $20,800 and the title. 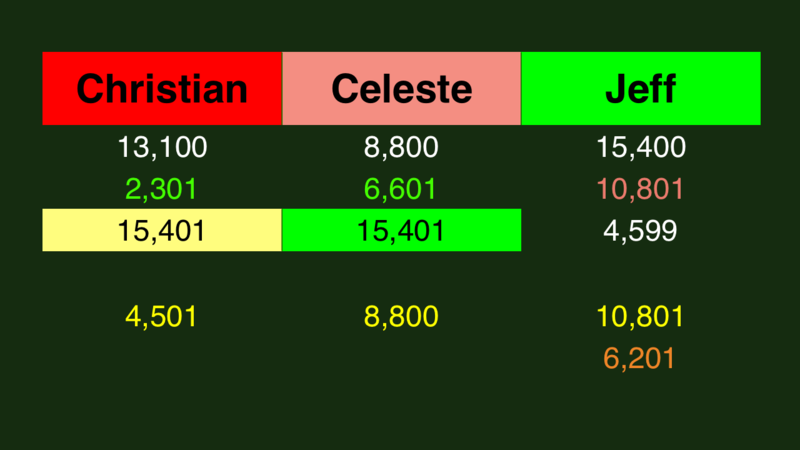 In the 2007 TOC semifinal, Celeste had another plausible wager: 200 max. to stay above where Christian would fall if he covered her and missed. Given that, Christian now had an alternative to wager 4,099 max. to stay above any “small” wager from Celeste (his actual amount of 2,301 falls in that range – although his intent was to cover a zero bet from Jeff). 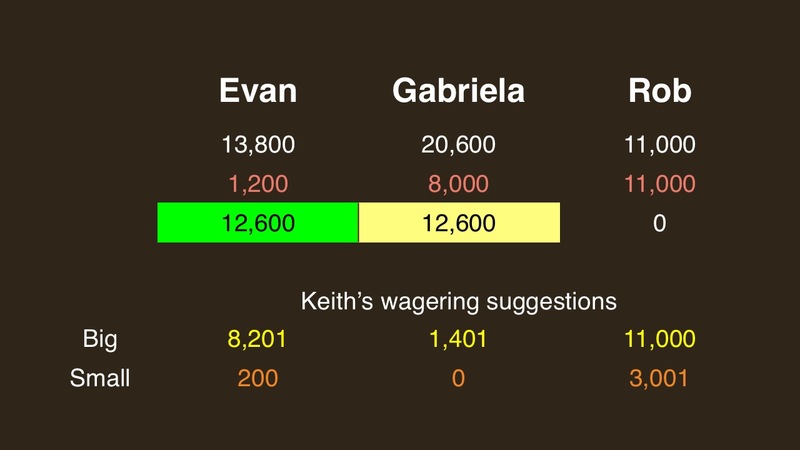 Celeste had the least optimal wager IMO – if she wanted to wager anything more than 4,200 she should have just bet it all (since she’d fall below where Jeff, the leader, would end up with a proper wager and a miss). The 2012 Teen Tournament game is a perfect example of why a leader in a tournament quarterfinal (or any game where the scores don’t have cash value for that matter) should NEVER bet more than the amount to cover second by a dollar (since the extra score won’t help you any if you’re right, and could cost you if you’re wrong). You are right on all counts, Kelly – thanks for picking these up. I had justified to myself removing the 200 option for Celeste, but can’t remember why! Ah, yes – I remember why I suggested Celeste go all-in: I found the 6,201 alternative wager from Jeff too strong to ignore. If he’s right, it costs him only if Christian goes too big, but he suddenly wins on the TS against rational wagers, and forces Celeste to answer correctly. This pushes Celeste to the all-in wager and Christian into an alternative Stratton’s situation. Maybe I was too tired when I did this. I also found another typo in one of the descriptions: With the 1996 Teen Tournament, Derek’s wager was 201, not 401, short of what it should have been. 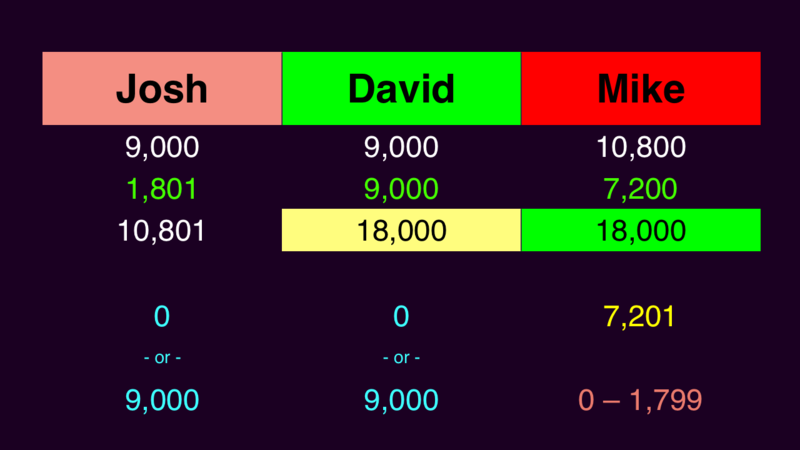 Kelly – Even if Josh had bet it all and doubled up, then they would have still had to play the tiebreaker round anyway. Yes, that would be a three-way tiebreaker! 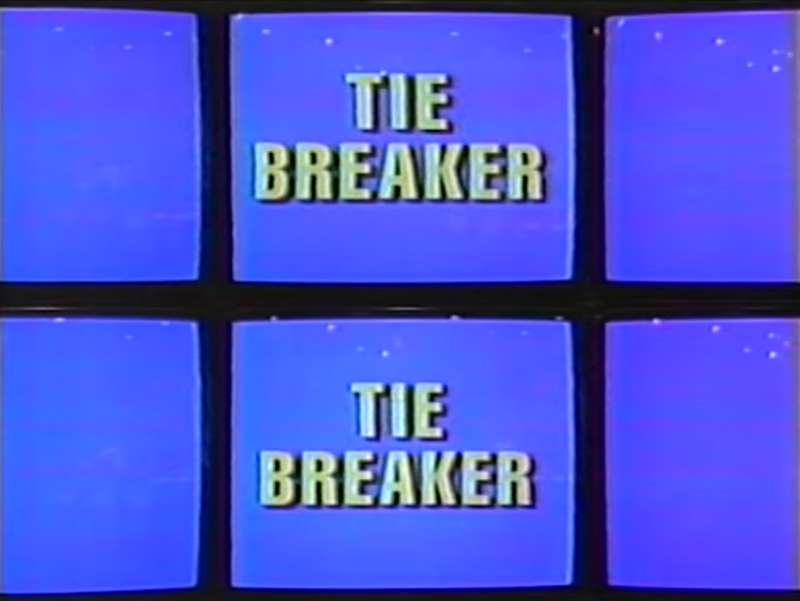 Now if Mike had bet to cover by a dollar and Josh bet it all, then the tie would be only between second and third place (and presumably in Kid’s games a tie for the runners-up prizes would be broken with the same protocol as in regular games). Make sure to add the 2014 Teen Tournament tiebreaker – that one was a doozy! How do you know what happened in the jeopardy teen tournament in 1996? On the j archive the game does not show up. I got it from an archived copy of the alt.tv.game-shows forum. Am I right in thinking that if there’s a 3-way tiebreaker, 2nd and 3rd get to play another tiebreaker? No – they’d just settle the tie as if the two players had tied for second.